It was while at the River Café that Jamie was discovered by a film crew doing a feature on the restaurant—and The Naked Chef was born. The concept behind the hugely successful television show was to strip food down to its bare essentials. Jamie’s hands-on style and laid-back attitude was like a breath of fresh air, inspiring everyone to cook. Jamie has never looked back. Probably the most public of Jamie’s activities has been his hard work in the transformation of food in schools. His initial foray into this arena was in 2005 in the U.K., with the series Jamie’s School Dinners. The effect of the show was profound— substantial improvements were made to the food being served throughout British schools. But Jamie wasn’t satisfied. 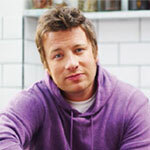 He set his sights on America with a new television series, Jamie Oliver’s Food Revolution.